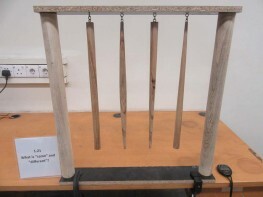 We have designed a simple experiment using conical shaped pendulums, to see where experiment matches theory. It is customary in practical work to ask when two measurements "match" and when do they "differ". Furthermore we need to find agreement of experiment with theory. This experiment aims to quantify the similarity (or difference) between various measurements. American Journal of Physics , T. B. Greenslade and A. J. Owens , 48 487 , (1980).